After almost three months of hanging around Lake Havasu City, Arizona, the itch to roll became too strong to ignore. So today we said goodbye to Lake Havasu City. We’ve hitched up and the wheels are rolling in search of new scenery. However, we won’t be venturing too far from the Colorado River. We’re actually going from one man-made Colorado River lake to another. The sunsets are always beautiful! We’ve thoroughly enjoyed our stay in Lake Havasu City. It was never our plan to visit western Arizona this winter, but when hurricane Harvey hit our favorite Texas Gulf Coast town square in the middle …. well, let’s just say the jello jiggled and we were onto plan B. Once our friends, the one’s we met last summer in Prescott, heard we weren’t going to Texas, they encouraged us to come spend some time with them on their property in Lake Havasu City (sure, twist my arm).They were eager to share their town with us and show us why they love living in Havasu. When Al and I sold our Colorado home on a whim five years ago, we thought we’d only be doing this full-time RVing thing for a year or two. Thus, we’re always looking at real estate, especially me. It’s one of my favorite pastimes. Hey, you can’t take the home builder/realtor out of me just because I live in an RV. I still love architecture and home design. With that said, our search to find a new home base started the minute we sold that last house. But if we’re being honest here, this RVing gig is kind of addictive and the thought of putting down roots in one location usually finds us hitching up and rolling before putting any ink to paper. To say we can’t (don’t want to) make a commitment would be an understatement. We feel very fortunate to have stayed and explored some beautiful parts of this country, and when we have the opportunity to immerse ourselves in an area, we think about the possibility of a home base. That certainly doesn’t mean we’d ever give up RVing. Nope, we enjoy RVing way too much to stop anytime soon! For starters, there’s a lake here along with a ton of other recreational opportunities. All that recreation makes for a great destination for a variety of people. During winter months, the town attracts retirees from colder regions around the U.S. and Canada. During spring months, the community fills with university students on spring break. Whatever hobbies or interests you may have, it’s most likely happening around here. There are all kinds of activities available for all ages. There are clubs to join for those living here and festivals to attend for locals and tourists alike. If you enjoy gambling, there are a bunch of casinos up and down the Colorado River and many offer live entertainment including top name talent. A variety of competitions take place in Lake Havasu City. Just a few of the events include the International World Jet Ski Races, a pyrotechnics convention, a speedway, professional fishing tournaments, custom boat regattas, charity events, a balloon festival, and more. Several golf courses around. Trouble on the links, Lady? Oh yeah! I’m one happy camper out boating. 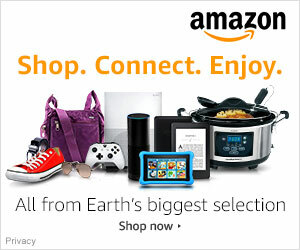 Toys, toys, and more toys! It’s all about the toys around Lake Havasu City …. Boats – you’ll see everything from kayaks to jet boats and everything in between. Cars – hot rods, sports cars, old cars. 4×4’s – Jeep’s, ATV’s, UTV’s. Aircrafts – large and small. RVs of all shapes and sizes with plenty of RV parks, state parks and boondocks to camp. Weather – From October to April the weather is wonderful and perfect for outdoor activities. The mild winter weather is a snowbirders delight. A regular part of our day included a three-mile out and back walk along the Bridgewater Channel. Al and I would start our walk at Rotary Park and walk under the iconic London Bridge and turn around at the Lake Havasu State Park. Hiking the stairs at the London Bridge became part of daily exercise routine. Housing and property taxes are relatively affordable and most lots have room to park those toys. There are some great hiking trails at the south end of town at Sara Park, and where there’s water, there are birds. So even though I didn’t get a chance to do my usual bird photography along the Gulf Coast this winter, I still managed to capture a few bird photos along the shores of Lake Havasu. Location – the location is great for connecting with like-minded folks. We kept very social during our stay, not only with our Havasu friends and their friends, but with other RVers. With Quartzsite only an hours drive to the south and Laughlin an hour to the north, there’s always someone passing through or stopping in Lake Havasu City. Our latest meet up was with Debbie and Steve when they spent a week in the area. Then a week later when Al and I needed to make a Sam’s Club run up to Bullhead City, we reconnected not only with them but also with their friends. Weather is not only a huge plus half the year, it’s also a negative. Summer gets hot around here. Lake Havasu City is lower in elevation than Phoenix, Arizona, which means summertime temperatures soar into the 100 degree Fahrenheit range regularly. Lake Havasu City holds the all-time record high temperature in Arizona history with 128 °F recorded on June 29, 1994. However, on December 31, 2014, snow actually fell on the town. The desert landscape around here is rather barren. You won’t find any majestic saguaro’s or desert wildflowers, but you will find plenty of rock. The longer I was here, the more I was bothered by the lack of vegetation. Shopping is limited. However, Havasu pretty much has everything I need these days. The biggest draw back for me personally is the distance to the nearest city. The closest major city is Las Vegas which is a 2 1/2 hour drive away while Phoenix is a 3 1/2 hour boring drive away. That means I can’t just pop in on my kids for lunch in Phoenix. Yeah, a bit too far away for a spur of the moment visit with one of the kiddos. When we spend a prolonged amount of time in a new location, we have the opportunity to learn about the area and that includes where to shop and good places to eat. Just in case you find yourself visiting western Arizona, here are some businesses in Lake Havasu City that we enjoyed and feel comfortable recommending. Grocery stores: I’m usually fond of shopping at a Kroger Grocery store (aka Fry’s or Smith’s in Arizona) but in Lake Havasu City, I prefer Arizona’s local supermarket brand, Bashas. The produce is fresh, local (when possible) and reasonably priced. Safeway comes in second. There’s also a RV friendly Walmart in town for non-perishables. Repair shops: During our drive from Phoenix to Lake Havasu City, we discovered we had a broken shackle on the RV. Once we set up camp and reassessed the situation, Al decided he didn’t feel comfortable doing the job himself. After all, we were on private property plus set up on gravel. With a little research, we scheduled the work with Adrenaline Trailers. They were more than happy to sell us just the parts, but we decided this seemed like a good time to have the bearings repacked and the trailer brakes tested along with having all the shackles replaced. They did a great job, although they were a tad messy with the grease. My truck needed general maintenance. This was the second time I used this small, two-man shop for service on my Toyota Tacoma and both times I was pleased with the work and the price. I even recommended E & J Auto Repair to fellow RVers, Laura and Kevin, for needed repairs on their Xterra. They too were pleased with Ed’s work. He doesn’t have a website but he can be contacted at – E & J Auto Repair, 1600 W. Acoma Blvd #60, Lake Havasu City, AZ (928) 854-9399. RV Parts: The top rubber seals on our RV slides were starting to deteriorate from all the extreme sun that we experience here in the desert southwest. We have used rubber conditioner, but being exposed to over 300 days of sunshine a year and 70-100 degree F temperatures takes a toll on our equipment. (I know, tough job dealing with all that sunshine 😁) The folks at Sunshine RV were very helpful in making sure we ordered the right rubber slide seal for our RV. 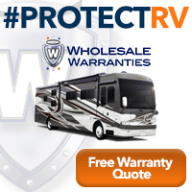 Sunshine RV became our go-to shop for RV parts. A new propane valve and shower seals were part of our purchases. Computer Repair: Whiz Kid was extremely helpful when I encountered some computer issues. Car wash: Our equipment was in dire need of cleaning. Mesquite Car Wash is owned and operated by a husband and wife team who enjoy RVing. As a matter of fact, they spent a year RVing full-time and would like to hit the road again if they could find a good manager for their business. Al and I had both our trucks detailed and the RV washed. They even have a nice outdoor sitting area and an inside ‘tiki shed’ with TV for entertainment while you wait. Good job and super friendly staff! Restaurants: Lake Havasu City offers a nice variety of local establishments as well as some of my favorite chain restaurants. This is a tourist town after all. On the local front, our first stop had to be Mudshark Brewery for their Vanilla Caramel Porter and Burger Monday special. Al loves this porter and first discovered it being sold at Total Wine & More in Phoenix. Once Al realized the maker of this tasty porter was located in Lake Havasu City, a visit to Mudshark Brewery became tops on the ‘must do‘ list. Next up was Hangar 24. Monday through Thursday during lunch they offer all their burgers at a special price of $7 and after 7:00 p.m. the appetizers are $5. The food here is really good, and I insisted we eat here one more time before heading out of town. A fun bonus for me was the ’70’s/’80’s rock music playing in the background. Guess with all the silvers in town, they considered the lunch crowd when choosing what music to play. Hangar 24 has a very casual party atmosphere with picnic table seating, occasional live entertainment, and even an outdoor swimming pool. Yeah, you read that right … a brewery/restaurant with a swimming pool. I’m pretty sure this is a popular spot for spring breakers. Silvers for lunch and breakers at night …. smart marketing! I had heard mixed reviews from fellow RVers about Barley Brothers Brewery. So we decided to check it out ourselves. The location is prime. Talk about a view! Of the four breweries we sampled, this one seemed to be the most expensive and didn’t offer any specially priced items. Although we enjoyed our meal and drinks, we enjoyed the view and location more. Near the end of our Lake Havasu City visit, we met Debbie and Steve at College Street Brewery and were pleasantly surprised with the happy hour prices … good food, good drinks, and of course, good company. Steve’s flight of beer was $6 while my margarita was under $4. College Street Brewery turned into one of those restaurants we would definitely return to for happy hour. Overall, Al thought Mudshark had the best beer. We both thought Hangar 24 had the best burgers. College Street Brewery had the best happy hour and Barley Brothers offered the best view! We had a great time hanging around Lake Havasu City and know we’ll be back … just not during the summer months. Hmm, after writing this post, perhaps Lake Havasu City should go on the short list of places to consider when we’re ready for that home base. It’s a thought! I love the diversity of spending time camped in nature one day and living near a major city the next. It’s an amazing joy not to have to choose one or the other and it’s probably one of my favorite things about living in the RV full-time – I’m not committed to a location. This sense of freedom is hard to explain, but I firmly believe it’s one of the top reasons RVing can be addictive. Fork in the road – city living or country living? The freedom to choose where we camp is wonderful, but there are times I feel torn and have trouble making a decision. Which way should we go? There’s so many things to see and do in a big city; museums, events, restaurants, stores … the list goes on, but the solitude and beauty of nature is always a strong draw and many times that’s my preference. Guess what? I don’t have to choose one or the other to call home. One month here, one month there, or next month it’s something in between. That’s how we roll. Ah, the beauty of full-time RV living. We get to be non-committal. After spending three months in Phoenix, Arizona (Oct, Nov and Dec), we started off the New Year by moving over to western Arizona to the small tourist town of Lake Havasu City. We’ve visited this area many times before and love returning. Even though our first two weeks here have whizzed by, I’ve had time to reflect on our three month stay in the big city. It’s a rare treat to find a RV friendly city, and when we do, we like to plan a lengthy stay allowing us plenty of time to immerse ourselves in everything big city life has to offer. Since our children live in Phoenix and Phoenix is RV friendly, this city has become a regular stopping point for us. You’ll find us traveling in, out and around Phoenix regularly. The Phoenix valley is not only a super popular snowbird location, but also popular with vacationers and convention traffic. Peak tourist season is January, February, and March … March being the busiest due to baseball spring training. Reservations for whatever kind of travel you choose during those three months are a definite must. You’ll also find lodging prices at a premium. The lodging options are abundant and diverse. For those of us with RVs, we can find everything from basic campgrounds to full on RV resorts complete with pools, pickleball courts, and golf courses. For non RVers, there’s everything from inexpensive hotels, to Airbnb’s, to mega resorts, and everything in between. Did I mention how awesome the weather is around here? That is, excluding summer of course! Camping at Lost Dutchman State Park is one of our favorites. Barely fifteen minutes to grocery stores, restaurants plus amazing hiking trails right out our door. Scottsdale and Phoenix are an easy drive away. There’s a never-ending schedule of art shows, craft shows, or home shows to attend throughout the year in the Phoenix valley. My daughter and I always manage to find time to attend a few. I’m never at a loss of things to see or do during my visits to the Phoenix valley. Although hiking and photography top my list of favorite activities, there are so many other great recreational and educational opportunities to explore. Here are some of the things we’ve done in Phoenix ….. Farmers market held all winter long in Old Town Scottsdale. Photo taken Dec 23 – yep, DECEMBER! My friend, Faye, and I enjoying freshly made Beignets at the farmers market. Come on, can’t be all about veggies! Since we visited the farmers market early morning, it was still on the cold side. By noon, we didn’t need those jackets any more. There are bunches of 5 star restaurants with award winning chefs located throughout Phoenix and Scottsdale …. plenty of culinary delights to satisfy any palette. Conventions and seminars are held throughout the year. Our son and daughter join us at the JW Marriott Scottsdale Camelback Resort for a TD Ameritrade seminar. This was the second day of the TD Ameritrade seminar and I got to meet Joe “JJ” Kinahan. If you’re a trader or CNBC watcher like me, shaking hands with JJ was a treat. JJ was getting ready to hit the links and enjoy the beautiful Phoenix weather while it was snowing in Chicago. TD Ameritrade and Think or Swim hold educational seminars once or twice a year in Phoenix and Al and I try never to pass one up. Always educational. We attended one of the best seminars yet this past December and had a couple of ah-ha moments. I was really excited about attending the WordPress Camp, but was sorely disappointed. I thought I’d be surrounded by fellow bloggers in the audience, but instead the vast majority of attendees work in the tech industry. This conference was geared toward businesses who work behind the scenes, who write code and do lots of other stuff that I can’t begin to articulate. It was all Greek to me. At least the food trucks were good! Lots of western history to explore around here along with the amazing trails. Because Phoenix is such a popular travel destination, we never know who we might bump into. It’s always a pleasure! During our three-month stay in Phoenix, we enjoyed several get togethers with bloggers and non-bloggers alike. Happy hour at Cave Creek Regional Park. From left to right: Dave, Faye, Al, Sue, Dave, me, and Lewis in the front. We all met via our blogs first – blogging leads to friendships! Jeanette doesn’t write a blog but she’s been following mine for a while and she reached out to me last year as she and her husband were preparing to RV full-time. Since then, they’ve sold the house, moved into the RV and are workamping at Usery Regional Park this winter. We’re hoping to do some boondocking with them this spring once the hot weather pushes us all north. This is just a small sampling of the folks we socialized with during this years three month stay in Phoenix. Every time we visit this city, our social calendar is as full or empty as we’d like it to be. Over the years, we’ve made some great friends via the blog and via RVing and Phoenix is the perfect city to physically connect with like-minded people. Although I enjoy most aspects of big city living, I have a need to be close to nature and wildlife. Fortunately, with plenty of parks and open space, I’m still able to get my nature fix while staying in Phoenix. You can expect to see or at least hear plenty of coyotes. The Quail are everywhere and I find them exceptionally entertaining. Gambels Quail are everywhere, and if you can’t see them, you can quite often hear them. Since they fly as a last resort, spotting a covey of quail running across a street, sidewalk, or trail is a common sight, and always makes me smile. Hummingbirds are also very common and entertaining to watch. Gosh, those little things buzz around so fast that it takes a great deal of patience to capture a photograph of one – a non blurry photograph. Obviously my patience during this visit eluded me as evidenced by the lack of a photograph. Oh well, next time! There’s some great scenery in this part of Arizona. Just outside of the city is one of my favorite scenic drives. Driving the Apache Trail makes for a perfect day trip, but before embarking on this drive do your homework. The stretch of road between the town of Tortilla Flat and Lake Roosevelt is a gravel road and can be pretty rough in spots. Aside from all the socializing and activities, we tried to get in as much hiking as possible to work off all those extra calories consumed. It was the holiday season after all. In addition, we managed to complete a bunch of maintenance on the trucks, RV, and our teeth 😒 And as if that wasn’t enough, I threw myself into a RV remodel project. I’m not ready to reveal the remodel just yet, but let’s just say, there was at least 24 yards of fabric involved with 10 more yards in my future. I’m loving my new window treatments and the fresh new look and wish I’d a done this sooner. Since we’ll be bouncing around Arizona the next few months, I’ll focus on completing the remodel in May when we’re back in a full hook-up site and sitting stationary for a few months. We plan on spending most of the summer back in Prescott, Arizona again. And speaking of sitting still, it came as a total shock to Al and me that at the end of our three-month stay in a RV Park in Phoenix, we weren’t ready to hit the road. Usually we get antsy after about a month and can’t get the wheels rolling quick enough. Not this time! We hemmed and hawed about extending our stay …. there’s that fork in the road again …. decision time. In the end, we lifted the jacks on New Years day in search of new scenery. It’s mid December. The days are short, the air is crisp, and the holiday lights are sparkling. Winter has arrived and we’ve finally had a cold front roll through here in the desert southwest. In Phoenix, Arizona, this past week the thermometer barely hit 70 degrees Fahrenheit … Brrrr! I’m sure my friends to the north are either tilting their head quizzically or scowling at me. Hey, when it’s been a consistent 90 plus degrees, anything much less than 70 degrees feels cold and has me putting on a sweatshirt. With that said, I think I’ve officially turned into a reptile. What other explanation could there be as to why 70 degrees would feel so cold to me? Crazy, I know! However, I must say the mornings and evenings do get into the 50’s and even 40’s, which is definitely cold and has me pop’n on the heat in the RV. With winter in full swing, it was time to make a big pot of soup, but not just any soup, Southwest Chicken Soup. Nothing like warming up from the inside out. Considering I’m in one of my favorite places; the desert southwest, why not embrace the unique landscape and culinary flavors of the region! With the soup simmering in the slow cooker, the RV is filled with a wonderful scent. While inhaling the delicious aroma filling the RV, I glance out the window and admire the landscape. I find the Saguaro Cactus intriguing. As a kid growing up in the Midwest, I thought this three armed cactus was a fabrication of cartoonists. I remember watching cartoons like the Road Runner, Huckleberry Hound, and of course Bugs Bunny. The background contained scenes of red rock, cactus, and the ever abundant tumbleweed … all foreign to a young gal growing up in northern Illinois among cornfields. Each saguaro cactus is unique and appears to have a personality of its own. 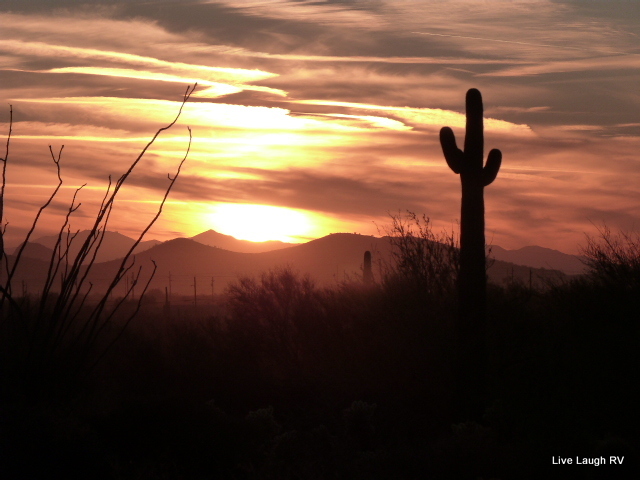 It took me weeks of living amongst these beauties before I was even able to pronounce the name saguaro correctly…. pronounced: sa-wha-ro. The saguaro cactus is a large, tree-sized cactus which can grow as tall as 70 feet (20 meters), and is native to the Sonoran Desert in Arizona, some parts of southern California, and northern Mexico. Saguaros have a relatively long life span, averaging 150-175 years of age with some living as long as 200 years. (Hmm, makes me feel like I’m a tiny spring chicken in comparison 😀) It can take 50 to 70 years just for a saguaro to develop a side arm. Arms are grown to increase the plant’s reproductive capacity … more arms lead to more flowers and fruit. Saguaros are very slow-growing and may only grow an inch or two during its first eight years. The growth rate is determined by climate, precipitation, and location. This army of cacti seem to have their own personality; some cute, some not, some look like proud soldiers, some like cartoon characters, and others look tired, twisted, and weathered, but no two are identical. Oh and by the way, the plural is either cacti OR cactuses – either is considered acceptable. AND then there is the rare crested saguaro. Why are some crested? 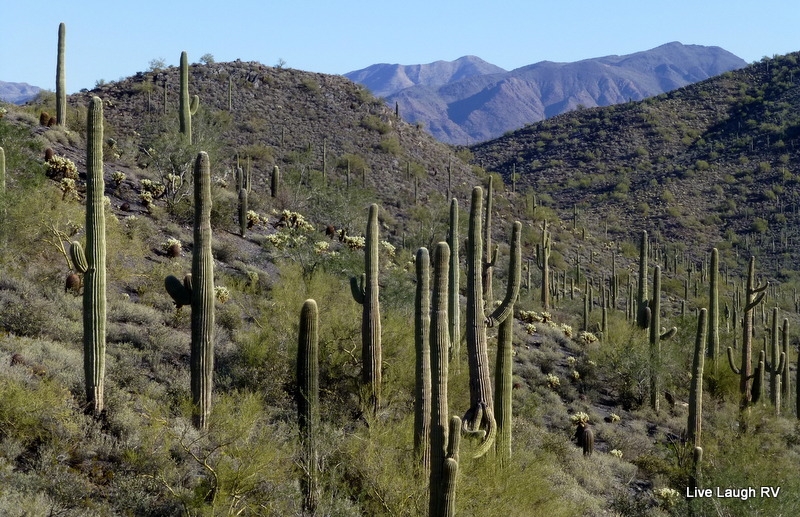 Saguaros rarely grow symmetrically and often grow in odd or mis-shapen forms. But on rare occasion, the growing tip produces a fan like form which is referred to as a crested or cristate saguaro. Biologists disagree about why some saguaros grow in this unusual form. Some thoughts; genetic mutation, lightning strike, freeze damage, but no one knows for sure why the unusual growth occurs. Fascinating to say the least for whatever reason! Whenever it rains, saguaros soak up the rainwater and the cactus will visibly expand. This might explain why the desert feels so alive after a rainfall. 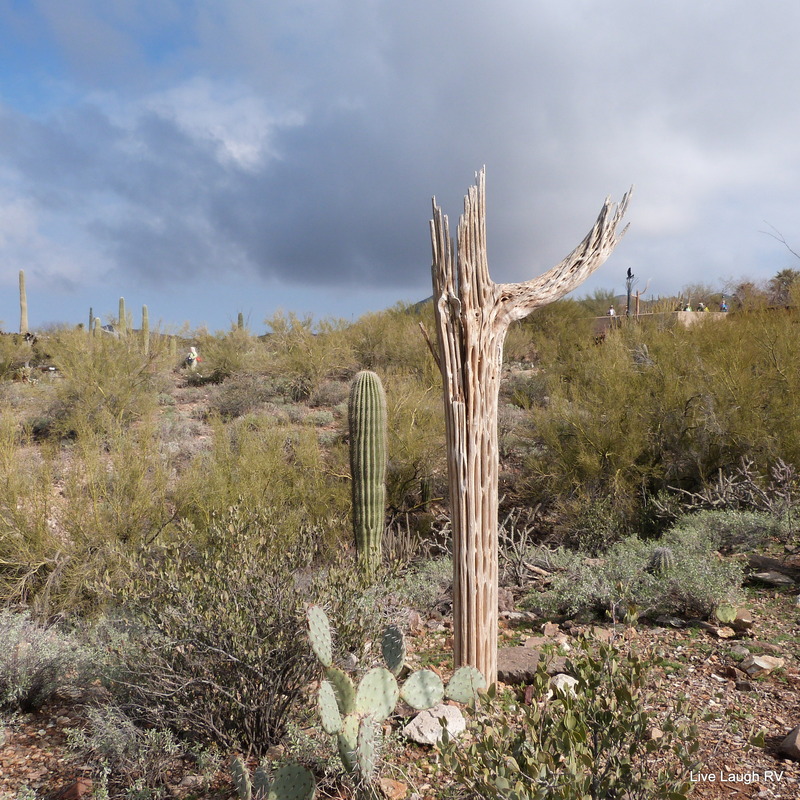 During a heavy rain, a saguaro cactus will absorb as much water as its root system allows. To accommodate a potentially large influx of water, the pleats of a saguaro cactus expand like an accordion. I was fascinated with the plump texture of this saguaro after a heavy rainfall. You can literally see the water trapped below the skin’s surface. Because the majority of a saguaro is made up of water, an adult plant can weigh as much as six tons or more. This tremendous weight is supported by a circular skeleton of inter-connected, woody ribs. The number of ribs inside the plant correspond to the number of pleats on the outside of the plant. This mature saguaro is dying off. We can see the inside ribs as the aging skin deteriorates. The saguaro cactus is an important part of the desert’s Eco system. The gilded flicker and Gila woodpecker excavate nest cavities inside the saguaro’s pulpy flesh. Large birds like hawks also use the saguaro for nesting and hunting platforms. 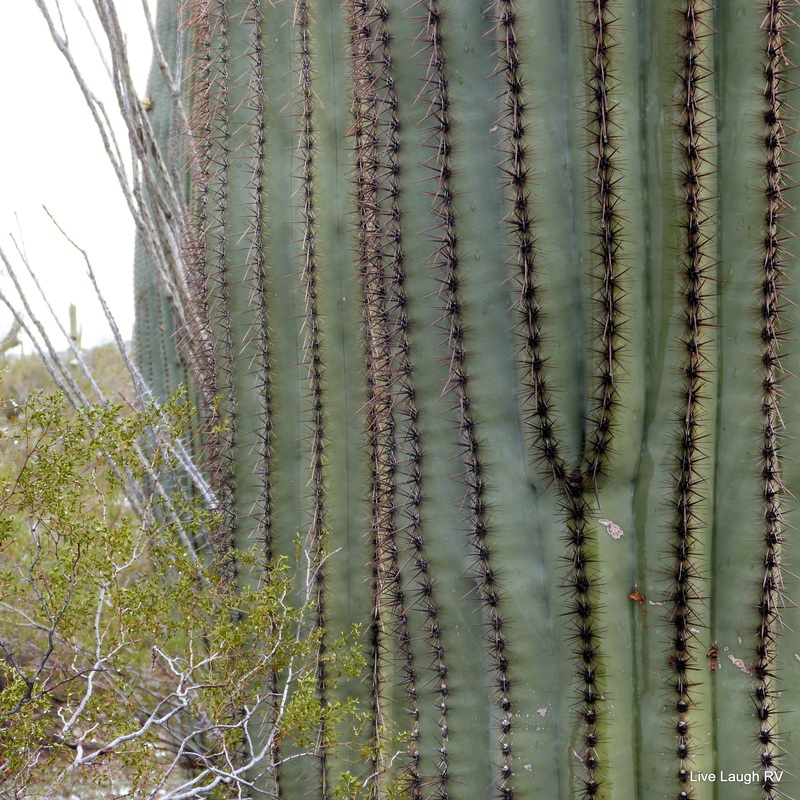 Their stick nests can be seen constructed among the arms of a large saguaro. In mid summer, the saguaro cactus provides a source of food for animals with its ripening fruit. Jackrabbits, javelinas, mule deer and other animals will eat the saguaro’s flesh during dry summer months, providing these animals with a much-needed source of water. I continue to be awed by the remarkable abilities of the plants and animals that thrive in the desert southwest. The desert can be a harsh and unforgiving environment. Perhaps that’s why I find it to be such a special and extraordinary place to visit. So what about that soup I have simmering? Let’s not forget why RVers flock to the desert southwest during the winter months. Sure it’s the weather and the amazing scenery, but it’s also the food. There’s no shortage of delicious eateries around the state of Arizona and the availability of fresh ingredients is a home cooks delight. Place all ingredients in a slow cooker (omitting optional ingredients) and stir to combine. Cover and cook on Low for 6 to 8 hours or High for 3 to 4 hours. When ready, ladle soup into bowls and top with your choice of cilantro, avocado or a squeeze of lime. Serve with a side of cornbread or crackers. These are affiliate links. Click here for full disclosure. 🎁Other specials I noticed …. The more time I spend in Arizona, the more I like it. It’s a fascinating state offering diversity and extremes. The landscape ranges from stunning red rock country to unique hills filled with cactus to dense forests of tall pine trees. In the morning, I can enjoy a cup of coffee in delightful 70 degree sunny weather in Phoenix and a couple of hours up the road I can go snow skiing in Flagstaff (that’s if I was into snow skiing). This kind of diversity can catch visitors by surprise and quite often does. A few years ago, we visited the south rim of the Grand Canyon the first week of November. The north rim had already closed for the season. We were well prepared for whatever weather Mother Nature had in mind, and I was actually hoping for snow. By mid October, all the campgrounds located outside of the national park are usually closed for the season. We set up camp at the only campground open year round offering hook ups; Trailer Village. With the overnight temps expected to dip into the twenties, we connected the electric only. The next morning as Al and I were ready to head on over to the rim for sightseeing, we chuckled as numerous RVer’s were struggling unsuccessfully with their water hose connections. Yeah folks, when the overnight low hits 20 degrees Fahrenheit, you can expect things like waterline’s to freeze up. When we arrived at the visitor center, we glanced at a couple of tour buses that had just pulled up. The moment the tourists disembarked in their summer attire, they were assaulted by the winter weather. We noticed the shock, disbelief and discomfort on their faces. While Al and I stood there comfy in our winter garb, we wondered if anyone bothered enlightening these European tourists. Several months ago, I made mention to a friend back in Illinois that Al and I decided to spend most of the year in the state of Arizona, including summer. My friend questioned our logic and wondered why we would stick around Arizona in 110 degree weather. And just like those tourists at the Grand Canyon, my friend had no clue about the elevation changes in this state. Let’s face it, Illinois is pretty flat. You want colder weather, you drive north. You want warmer weather, you drive south. Easy peasy, huh! But it’s not so easy in the west. It’s all about elevation and has nothing to do with north or south. This lizard and I both like sunny warm weather. Does that make us both reptiles? A little over a week ago, the temps in Phoenix were nearing that three digit mark. That was our cue that it was time for us to head to the hills. Our one hour plus drive took us from Phoenix’s elevation of 1,100 feet to Prescott Valley’s 5,200 feet, and the temperature dropped more than twenty degrees…. brrrr. Al and I were cold. Had our time in the valley of the sun turned us into reptiles? Anything less than 70 degrees and we were donning sweatshirts! Our home for the next few months! Since we’ll be staying in Prescott Valley at least a couple of months, I decided to do a little homesteading and plant a garden. I haven’t done any digging in the dirt since we went full-time in the RV four years ago. I purchased three planters, a bag of dirt, and a bunch of plants; parsley, rosemary, thyme, cilantro, chives, and tomatoes. I think I’d be dating myself if I said I was humming a Simon and Garfunkel song while planting my garden …. So our first week in Prescott was a busy and fun one which included a day trip to the Grand Canyon for a picnic lunch. Fun planting my little garden. Hiking at one of my favorite locations – Watson Lake. And trying to stay warm as a cold front accompanied by a record rainfall blew through the area. I have a few more entertaining things planned for the month of May. Let’s hope Mother Nature is agreeable and she won’t make me bundle up …. even more! Thanks to the unusual and excessive rainfall this past winter in the desert southwest, the hills have come alive. I don’t think I’ve ever seen the Phoenix valley so green, but it’s not just an abundance of green that has carpeted the land. Everywhere I look, I’m greeted with a delightful kaleidoscope of color. The wildflowers are on steroids this year and I’m loving the view. Each bloom, bush, and tree is a wonderful sight to behold. The stunning display of wildflowers is an unexpected surprise to those visiting the desert for the first time. The desert southwest is lush with vegetation and color and a far cry from the drab, barren brown most folks associate with a desert. Spring hiking in the desert is the best! I always look forward to spring in Arizona, and couldn’t wait to share some of my favorite Phoenix valley spots with my daughter. First up was hiking at the Superstition Mountain located on the far east side of the valley. This is my absolute favorite place to hike in Arizona. My daughter – it was a glorious morning to hit the trails. March 2nd – Al and I managed to snag a lovely campsite in the overflow loop for a couple of nights of dry camping at Lost Dutchman State Park. This is a popular state park and without a reservation, it’s difficult to nab a site with electric. By camping at the base of the Superstition Mountains, I was able to hike multiple times throughout the day and photograph the beauty that surrounded me. Sharing this amazing scenery with my daughter was a special treat. If you ever find yourself visiting Phoenix and looking for an entertaining way to spend a day, here’s a post I did a while back about the Apache Trail that you might find fun. Who knew the desert could be so colorful? ‘I know, I know’, she exclaimed with raised hand! And once the wildflowers wither, it’ll be time for the cactus to bloom. The color of spring in the desert is a memorable and unique experience …. not to be missed. March 13, 2016 March 14, 2016 by Ingrid95 Comments on Computer Woes! Change is an interesting subject. Most times I embrace change whole heartedly. That shouldn’t be a surprise considering a mobile lifestyle is all about change. But then there are times or situations that I resist change as much as possible. I was resisting the thought of getting a new computer and learning Windows 10. Just thinking about it had me walking, rather running, in another direction. The mere thought of dealing with technology change almost had me breaking out in hives. If there was a word depicting the opposite of Geek, that would describe me to a tee. I am definitely not a techie. With that said, the past month I chose to play ostrich and avoid the subject by leaving the computer off. I must admit, the break from the internet allowed me to complete a bunch of projects around the RV as well as get in a fair amount of hiking. I knew months ago my laptop was slowly doing a death dance, but I loved the old gal. She and I got along famously for years and I wasn’t interested in changing things up. She loyally cared for my thousands of digital photos, put out hundreds of blog posts, and supported all my documents. Her keys were worn to the point that half the letters were no longer legible making it impossible for Al to use my laptop (he’s never managed to memorize the keyboard and still pecks away at the keys 😆 ). She sported a huge crack along one side that seemed to be growing and her screen was no longer firmly attached, but we were a comfortable fit. Day in and day out, she’d sit on my lap providing endless hours of entertainment. Perhaps too many hours. I had no intention of replacing her. Quite frankly, I didn’t want a new computer, but after months of babying her and refreshing her to factory status, she just wasn’t up to the task at hand. She was tired and wearing out, and when I could no longer upload my photos, I had to embrace the thought that change was necessary. Plus, I was missing you guys! I shopped, then shopped some more. I’m usually a very decisive shopper, but not this time. Google became my best friend enlightening me on the differences between Intel’s i3, i5, and i7 processors. A Mac was out of the question. First, it wasn’t within my budget, and second I felt that would be too much of a change. Although last year’s change from an Android to an iPhone was ezzie peezie and I love my iPhone 5, I just wasn’t going to go from a PC to a Mac at this point and time. navigating obstacles can be fun! It’s been a week and my new HP Pavilion laptop and I are getting along swell. Windows 10 wasn’t the navigation nightmare I thought it might be. Yes, it’s different, and yes, the first few days I was Googling “how to” a lot, but I haven’t broken out in sweats or hives due to the change. I’ve even been having fun setting the new computer up. We’re still closely monitoring our data usage considering we almost maxed out our 30 gigs last month and I was hardly on the internet. Apparently, Al’s computer and my old computer had programs running in the background that were gobbling up data. Thus, my internet presence was throttled severely. I’m hoping to be back blogging soon and am starting to catch up on all your latest posts. I’m still a little slow with the new gal, but the more time we spend together, the more familiar we’ll get and I’ll soon be sharing plenty of photos of the desert blooming. You’ve been warned! For those of you curious, this is the laptop I ended up getting….